Seven people were killed by Israeli army gunfire and 1,070 others were injured during protests on Friday, as thousands of Palestinians gathered along the Gaza border, many burning tyres and throwing rocks. Since last Friday, 29 Palestinians have died in connection with tensions along the border while more than 2,500 have been injured. Gazans camped along the border and set thousands of tyres ablaze and used the thick smoke and mirrors to obscure the vision of Israeli army snipers. 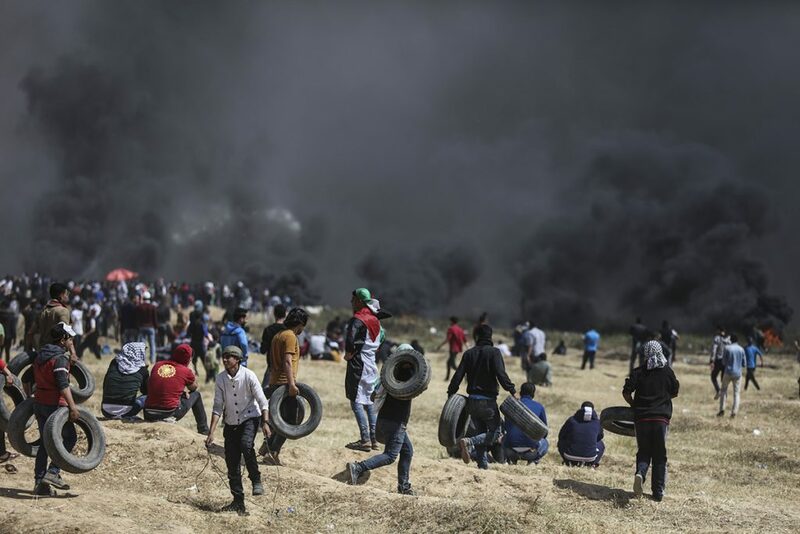 Pillars of black smoke emanated from the Gaza Strip as roughly 20,000 Gazans gathered around the border area and smaller groups of mostly young men pushed towards the border fence. The demonstrators are staging a six-week protest, dubbed the “Great March of Return,” to call for a return of Palestinian refugees and their descendants who fled or were expelled from their homes in present-day Israel in the 1948 war that marked Israel’s creation. “I came here to defend my homeland, make my dream of return true and get the occupiers out of my country,” said Walid Abu Bakrah, 22, a painter, along the border area. Over 150 Palestinians were injured by live fire and rubber bullets on Friday, said Ashraf al-Qedra, spokesman for the Hamas-controlled Health Ministry, and many more suffered from tear gas inhalation. Israel has said that Hamas, the Islamist group that rules the coastal enclave and is considered a terrorist organization by much of the West, is using the protests as a distraction to carry out attacks on Israeli border towns and security infrastructure. Israel has warned that it has not changed its policy of firing on Palestinians who approach the Gaza-Israel border fence. Human rights groups have criticized Israel’s use of live fire as disproportionate to the threat posed by Palestinians throwing rocks, burning tyres and lobbing petrol bombs. Multiple videos from last week, which the Israeli army rejected as “Hamas propaganda,” appear to show Palestinians being shot while not posing an immediate threat. Liz Throssell, a spokeswoman for the UN Commissioner for Human Rights, said Friday that “there are strong indications” that the army used excessive force last week. UN Secretary General Antonio Guterres and others have called for an independent investigation into the deaths, while Israeli officials have defended army actions. Israel has said that some of the Palestinians who were killed had fired on army positions and that the majority of them were affiliated with Hamas’ armed wing and other militant groups in the coastal enclave. Hamas seized control of the Gaza Strip in 2007 and has since fought three wars with Israel that have crippled Gaza’s economy. The coastal enclave has an unemployment rate of more than 40 per cent and faces a dire humanitarian situation exacerbated by a years-long blockade by Israel and Egypt. It will also coincide with the US embassy’s planned move on May 14 from Tel Aviv to Jerusalem, which has inflamed tensions.